Pot: 8cm diameter x 7cm high (approx 3¼in x 2¾in). 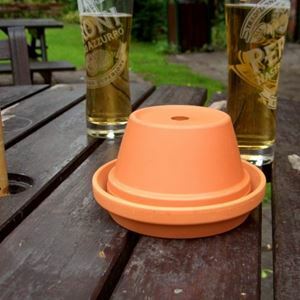 A mini version of the larger flower pot ashtray, this weather resilient terracotta ashtray utilises a flowerpot & saucer to make a practical outdoor ashtray for use in pub & restaurant beer gardens. 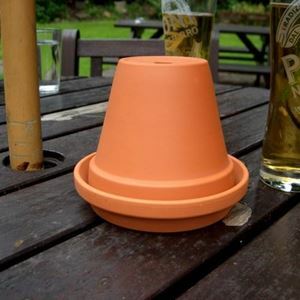 Ash & stubbed out cigarettes can be deposited though the inverted pots drainage hole into the saucer where it is contained, preventing ash from blowing everywhere especially on windy days. 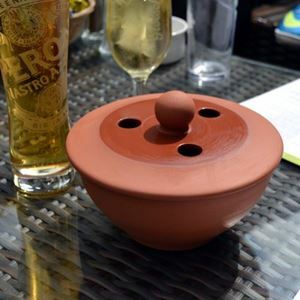 For ease of cleaning this terracotta ashtray has an internally glazed saucer.